Now that I’ve been blogging for almost two years (!!!) I’ve learned a little about being a ‘blogger.’ It’s odd because a lot of people don’t really understand what I do, but they always have an opinion. Here’s a few things I cringe when hearing. Don’t get me wrong, I love suggestions. But more specifically, I love realistic suggestions. If your suggestion is to write a post about you, or your dog, or your project you did for your class chances are I’m definitely not going to write that post. However, if your suggestion is aligned with my subjects I talk about I totally consider it! This one is tricky because it mainly makes me feel guilty. I know I’m very inconsistent with my blogging. No need to remind me. 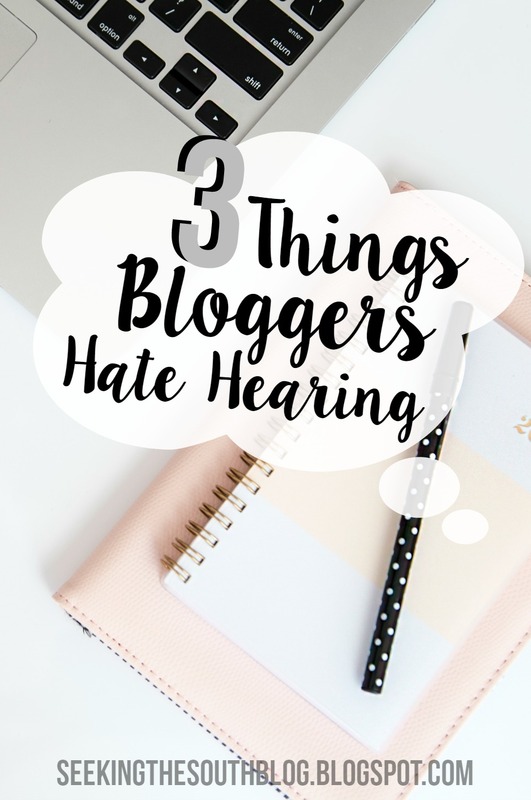 But I don’t think non-bloggers really understand why blogging gets tough. So much more goes into it than just writing and posting. You have to write and edit and photograph/search for stock photos, edit said photos, schedule your post, schedule your social media posts… it’s a lot. So when I haven’t blogged in a while, don’t remind me, I already know. This might be just me, but if you know I have a blog, I hope that you’ve at least glanced at it. In the very least, just lie and say you’ve read some of it. I’m not going to quiz you. I don’t care if you don’t read every post or anything, it’s just kind of insulting that you didn’t bother to check it out. Just a mini little rant for me today! I hope everyone is having a great week! I have an exciting/busy weekend coming up so be sure to check out my twitter and instagram to see what I’m up to!